Was at boot camp this morning, pondering all kinds of things in my head to keep my mind off how I really don't enjoy sprawls, and then it occured to me that after I completed today's work out - I can call myself a 3-year veteran of CrossFit Central's Relentless boot camp programs. I joined February programs in 07 - when talked into it by my friend Irene while selling girl scout cookies at a booth in Lakeway. Cookie sales for the 2010 season are well underway in case you haven't been hassled by a Girl Scout yet, as will be the start of my 4th year of working out with CrossFit Central next Monday. Today also marks a new chapter - I'm leaving my role as business ops manager at CrossFit Central. I might join Jeremy in new adventures yet to have solidified - so don't say bye yet... BUT, if you rely on me for billing issues, or enrollment or other boring paperwork stuff - I'm not your gal any longer. Sad, yet looking forward to next adventures all at the same time. So as I ponder just a bit more over my coffee and realization of the need of a good hot shower, I think how the last three years have changed my life - my body, and my circle of friends. I'm thankful for the body changes, but so much more for the wonderful circle of friends I'm gathering along the way. My dad told me that I'd be able to only count my number of friends who I could really, really rely on on one hand. Turns out - he was wrong (happens rarely, I know Pop)... Good thing to be wrong about. 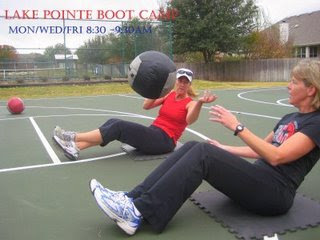 Now - on to February 2010 and the Relentless Boot Camp Adventure Challenge - where my pals Vanessa and Jane are going to tear it up! Will run my third (and final?) 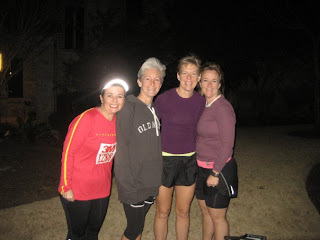 half marathon tomorrow - 3M along with pals Mary, Kelly and Chris... Advanced Kudos to Chris who will run her very first half -- and it wasn't that hard to even talk her into it! Her CrossFit training which includes 5 days of boot camp, gym or KB will make this a breeze for her. Come and cheer us on! 8 round tabata work out! For a detailed description of the WOD for new years, see Mel's post... For Chris and I it was swings, sprints, sdhp and push press. Lots of fun and as a reward, we hit Torchy's for a yummy, "new year's pat on the back for getting out of bed on this cold day" reward. Cause I have to admit, if Chris had not sent a text to say she was coming to get me (to which I responded with the general, non-exciting, "OK" - well, I might have stayed in my warm bed. Thank you Chris. Thank you Mel for your creativity and drive. Never Cheat. Never Quit. Happy New Year all. It's going to be a great year. Planking with a KB on your back, hangin out with my buddies for a work out before the Christmas eating madness... PRICELESS.